Sword Art Online: Hollow Realization Collector's Edition Giveaway! Sword Art Online: Hollow Realization Collector’s Edition Giveaway! 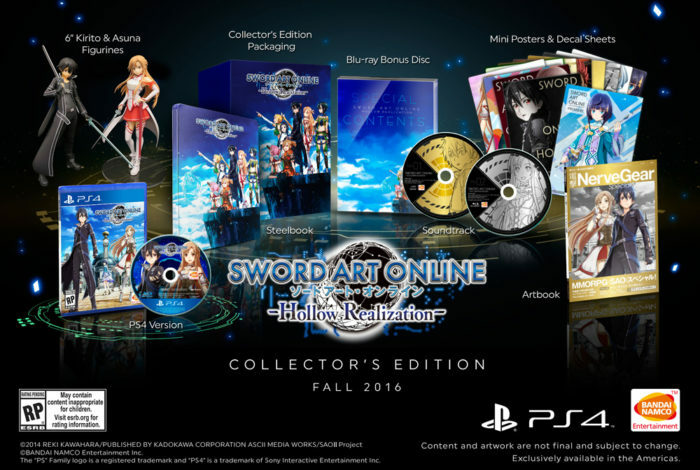 Home » Guides » Sword Art Online: Hollow Realization Collector’s Edition Giveaway! Our friends over at Siliconera are offering one of you lucky readers the chance to win a Sword Art Online: Hollow Realization Collector’s Edition, courtesy of Bandai Namco. The Collector’s Edition has pretty much everything a dedicated fan could ask for. Included within is the game, an artbook, mini posters and decal sheets, Blu-ray bonus disc, and 6″ Kirito and Asuna figurines all brought to you in some fancy collector’s edition packaging. Hollow Realization takes place in Sword Art: Origin, the latest game created from the seed unlocked by Kirito and his friends. Players will venture through a redeveloped Aincrad, which is now one huge wide open world known as Ainground, and guide a group of four through a familiar, yet altered world. If you want a chance to net yourself the Collector’s Edition, just complete the form below. The more ways you enter, the better your chances of winning. The giveaway is open now and will close on 12/21/2016 at 11:59 PST.